Cut wood in your desired size and cover with chalkboard paint and use as placemats! Follow the tutorial on the source to create this idea. See a tutorial for this idea using plastic placemats instead of wood. See a tutorial for this idea using chalkboard fabric. See a tutorial for this idea using clear chalkboard paint. See this idea using decorative duct tape to frame the placemats. 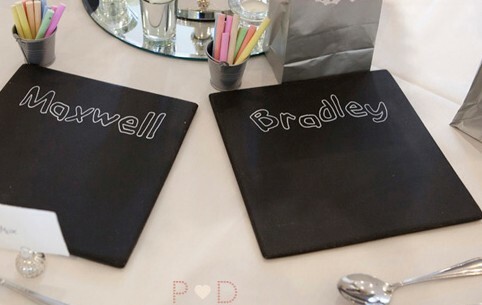 See a tutorial for this idea where the whole table is covered with chalkboard paint and the placemats are drawn onto it.